Secreted growth factor that induces neurite outgrowth and which is mitogenic for fibroblasts, epithelial, and endothelial cells (PubMed:1768439, PubMed:1733956). Binds anaplastic lymphoma kinase (ALK) which induces MAPK pathway activation, an important step in the anti-apoptotic signaling of PTN and regulation of cell proliferation (PubMed:11278720). Binds to cell-surface target proteins via their chondroitin sulfate groups (PubMed:26896299). 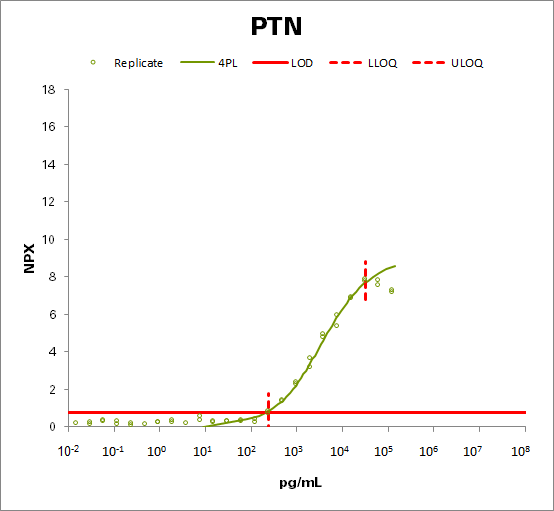 Down-regulates PTPRZ1 activity (PubMed:16814777).